"The Skin I'm In is a hero's journey, and it offers us the fruits of return: courage, clearer seeing, transformation, increased self-knowledge, and reverence for a universe of connectedness that is inherently sacred. At the heart of Brody's story, there is both great simplicity and great expansiveness– in other words, great humanity. It takes an intense and gentle strength to honor the path of self-discovery. I hope that our work will resonate near and far, awakening the inner artist healer to find renewal and self-expression through the embrace of process. Now crank up those speakers!" "Making The Skin I'm In was a largely solitary endeavor for close to six years. It was thrilling to discover Ronit's music and to get the opportunity to collaborate with her. She took an intimate, quiet and sometimes painful story and showed me that The Skin I'm In was worthy of a strong musical voice. 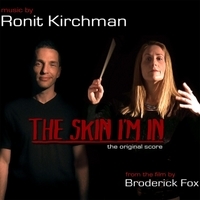 Ronit's score brings together electronic, orchestral, and sampled layers in surprising ways, taking a small film to some very big places. I was perpetually amazed by our ability to communicate on intellectual, emotional, musical and intuitive levels. Thanks Ronit, and may the Goddess we invoked continue to beat her drum with all her might."